Ane is with me today and we are chatting about her latest book. In order to be entered for a FREE book or e-book (winner's choice), please leave a comment at the bottom of this blog, or in the comment section on FB to be entered. Before we discuss your book, Ane, there is something we must know. What is your favorite dish that you enjoying serving to your family? Recipe please. Shepherd’s Pie, but I don’t cook that much anymore. I have a chef for a son, and he cooks a lot. But Hubs and Chef Son love my Shepherd’s Pie. I use been shanks, cross cut, instead of hamburger. Pre-cook the cross-cut beef shanks in a crockpot all day, covered in water with a Tbls of Better Than Bullion brand Beef Base. About 45 minutes before you plan to eat, remove the meat from the crockpot, break into small pieces. Set aside. Peel and cut potatoes into 2” pieces and boil. When ready, mash and set aside. Brown the onion and garlic in some olive oil. When it's slightly caramelized (5 minutes or so) add the mushrooms and cook till brown. Add the corn , mushrooms, peas, tomatoes, and cooked beef. Cook for 5 minutes. This is an old family staple, a one-dish meal. It's also cheap. Serve it with bread rolls. It's the kind of thing you simply throw together. I guessed at the amounts. You can adjust them to your tastes. I bet Hubs love it. Ah dear 'Hubs'. How did you two meet? We met on a blind date, and my date was the other fellow. We switched halfway through the evening, and the rest is history. We’ve been married for 45 years. I still can’t figure out the math on that since I’m only 35. What fun! I bet he's a romantic, am I right? You’re kidding, right? My hubs is a Brit. They’re not notoriously romantic. Which is pretty funny if you think about it. He married a writer! Poor guy. But perhaps the special thing he has done for me is paint the artwork used for my Chapel Springs series. He had to pull an imaginary town out of my head and get it on canvas, but he did it! Do you have a piece of jewelry that is special to you? I had a heart shaped locket covered in seed pearls that was my adoptive grandmother’s baby locket. When I met my sisters, one of my nieces has a daughter whose name is the same as my grandmother’s, Anna. I gave the locked to my grand-niece. I love tying the two families together like that. I bet you have a guilty pleasure. Do tell! M&Ms. But they’re not a guilty one. Chocolate is one of the major food groups. Chocolate, Coffee, Protein, Bread and Pasta. Those are the 5 major food groups. Let's get to what we all want to know. Tell us about your latest book. This is the book of my heart. It’s about a woman who gets connected with her birth sisters. Her story doesn’t go like mine. My birth sisters welcomed me with open arms. As for Claire, she’s up to her eyeballs in a contested election for mayor and finding out who or what is haunting the old theater. God is faithful with out dreams. He will make them come to pass if they will bring Him glory. Now you have me wondering: Do you ever become your heroine? Oh my yes. Claire is a klutz. She got that from me. Just today, I was meeting a friend for lunch. It’s been raining, and I forgot I was wearing flip flops. I entered the restaurant, moving too fast, and my left foot hit the polished concrete and zipped out from under me. Down I went. What an entrance. So now you see where Claire gets her “move without thinking” MO. And do you write about any real life problem from your own experiences? Absotootinglutely! Chapel Springs Revival came from an overheard conversation about marriage. (Yes, I eavesdrop, so be careful what you say). Chapel Springs Survival was inspired by our eldest son getting himself a 21st Century mail order bride. And Home to Chapel Springs is from my own story of finding my birth sisters. 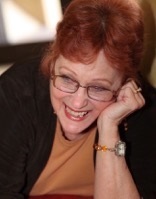 Your readers can read that story on my website under My Adoption Story. 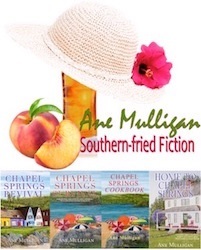 “Ane Mulligan has written a book that just can’t be denied! Once you pick it up and begin to read — you’re hooked — to the very end. And it’s not because aliens are taking over the planet . . . or super heroes are saving the planet. There are no time travelers, no vampires, no diseases. What there is — is a great story about normal people! Well, Ane did have to throw in some really cool characters, like a racecar driver and a best-selling author. But here’s the catch. They really are normal people — with normal problems. The racecar driver walks out on his wife, taking all her money — and leaves her with nothing but heartache, bills, and their son. And that’s just a small part of the book! I love reading books by Ane Mulligan, because she writes about life — the good, the bad, and the ugly. But even when I find myself identifying with her characters, I also find myself laughing at them. And my life — my problem — seems a bit easier to bear. Thanks, Donna! Your check’s in the mail. Labels: adoption, Ane Mulligan, book giveaway, God is faithful.